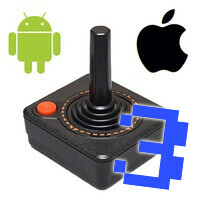 So, you are looking for some old school games that you can play on your iPhone or Android smartphone? You've come to the right place as we have once again collected 10 classic titles that have been ported to today's most popular mobile platforms. As always, do not hesitate to tell us what you think about the titles we've picked, and in case you know a great retro game that we've missed, just let us know by dropping a comment. Also, check out our first and second selections of old school Android and iPhone games, in case you've missed them. The Metal Slug series were fun, challenging, with lots of weapons and pretty graphics, which is why once they were among the most popular jump and run games in arcades across the nation. Today, there is a decent port of Metal Slug 3 for the iPhone, which you may check out, as long as your budget can handle the steep price. Before World of Warcraft there was Warcraft III, and before Warcraft III there was Warcraft II available on the PC and the first-gen PlayStation console. This old school classic can now be played on Android too, including the expansion packs that Blizzard released for it. Installation is a bit tricky so make sure you read the instructions first. This is a remake of Ultimate Mortal Kombat 3, which was very popular during the '90s both in arcades and on home consoles. It includes all 23 characters and 16 levels, a multitude of special finishing moves, and a multiplayer mode over Wi-Fi or Bluetooth. Here is another remake of a classic fighting game - King of Fighters, this time for the Android platform. It features 20 familiar characters and 5 game modes, including Team Battle for three-on-three fighting action, Single Battle for challenging a single opponent only, and Endless mode that tests your skills in an everlasting series of battles, which you must fight with one character only. Tyrian is a vertical space shooter that some of you may have played on their PCs back in the '90s. It comes with tons of weapons, upgrades, multiple ships to fly, secret levels, and hidden power-ups, which all make it an excellent specimen of the popular genre. The Atari Jaguar is among the more notable console fails of recent history, but there were a few good games made for it. Tempest 2000 was one of them, and Cyclone 2000 is a clone of it. It is a 3D space shooter with tens of challenging levels, useful power-ups, and a great soundtrack. Kula World is a great puzzle game that debuted on the first-gen PlayStation console. The player controls a beach ball in a three-dimensional world, collecting keys, items, avoiding obstacles, and using the level to their advantage. Don't be fooled by how easy the first stages look as the game gets fiendishly difficult as you progress. There are 200 levels for you to explore. The awesome RPG title Shining Force, which debuted on the Genesis home console, is now available on the iPhone, courtesy of SEGA. If you are a fan of turn-based battles, this one deserves to be tried. Yeah, we know it is kind of a girly title, yet Ecco the Dolphin is still a classic adventure game that many of us liked back in the days. The graphics are nice, music is good as well, and the game itself is challenging, so it does not get boring too fast. Wanna know what portable gaming looked like back in the '80s? Want to relive the days of collecting virtual, monochrome eggs inside a virtual, monochrome basket, just to reach a new high score? Then here is the game pack just for you, available at no charge for your Android device.